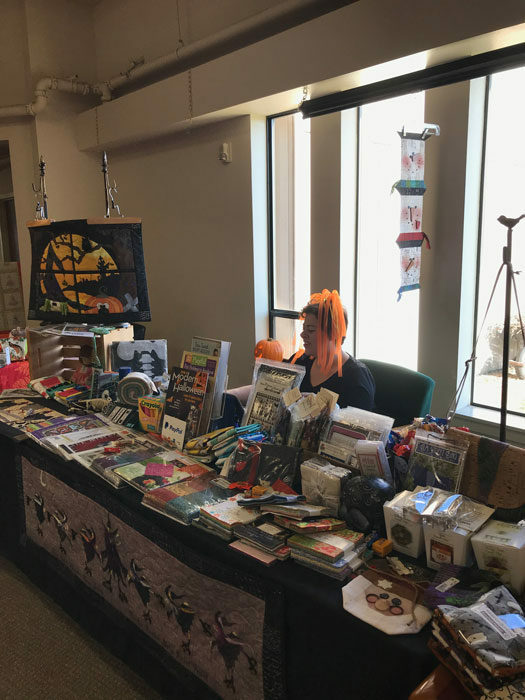 Saturday was my first time exhibiting in costume! 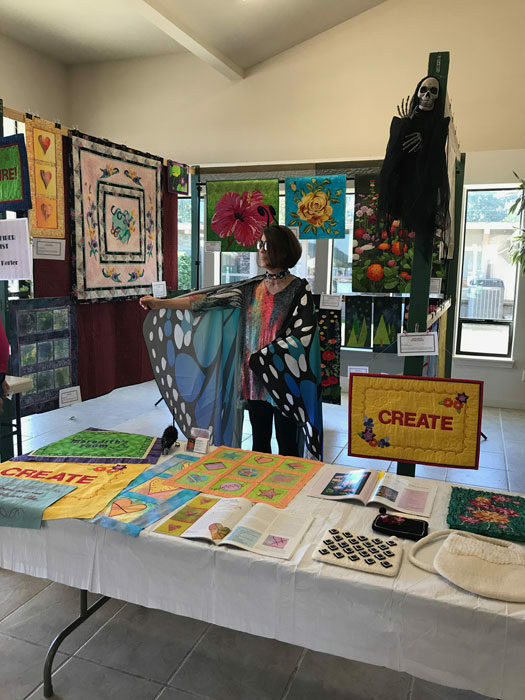 When I was invited to be the guest artist at the Columbia River Piecemakers Quilt Guild Show, I was told most of the guild members would be in costume. Why? 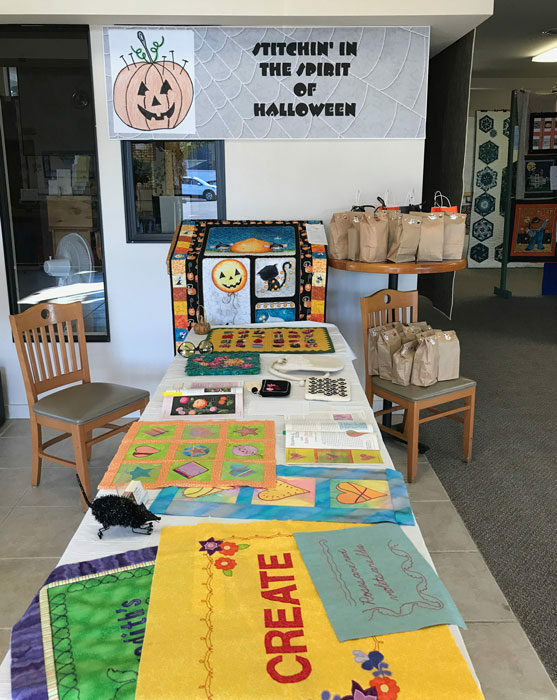 Because St. Helens is the site where Disney filmed Halloweentown, which the town celebrates during the month of October with a variety of activities. 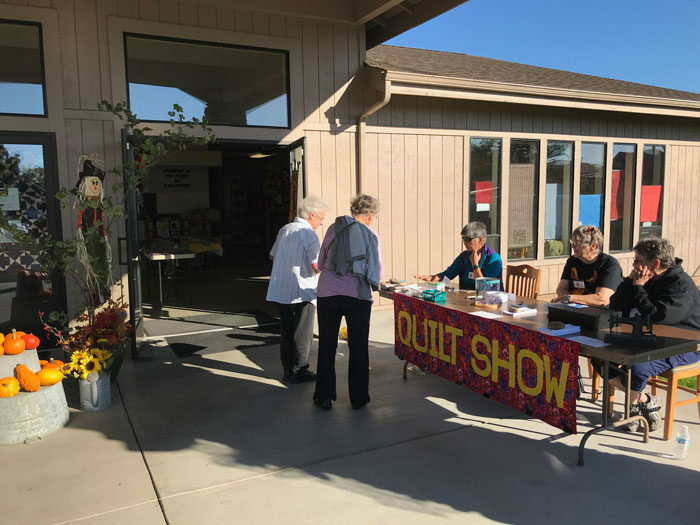 The guild moved their bi-annual show from September to October to be a part of this. I didn’t think I should be the only one not wearing a costume. My first thought was to sew one. But when I realized how long that was going to take, I went on Amazon and looked to see what was available ready-made. 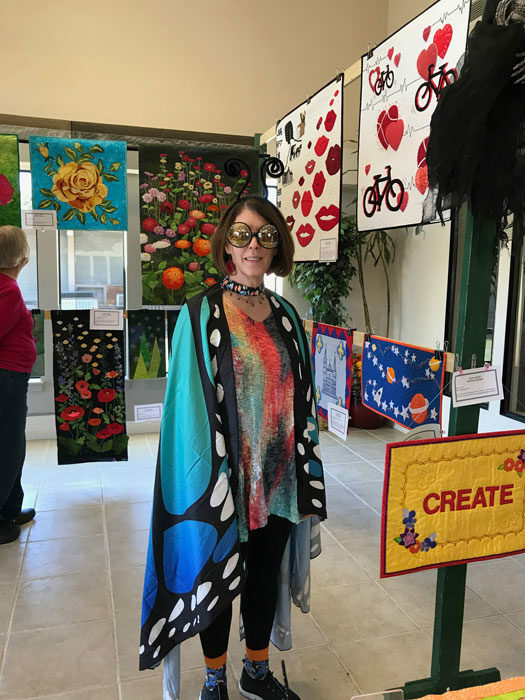 I saw quite a variety of butterfly wings and decided that would be easy. I bought a set of antenna and a great set of buggy-eyed glasses to wear with the wings. I matched the wings to a colorful top I own and wore a pair of black leggings. The costume worked out well and the bonus was that it was easy to wear while talking to people about my work. My niece Meredith came to the show, and I had her take some photos as proof I did, in fact, wear a costume. Here’s the show entrance. We had a beautiful sunny day. 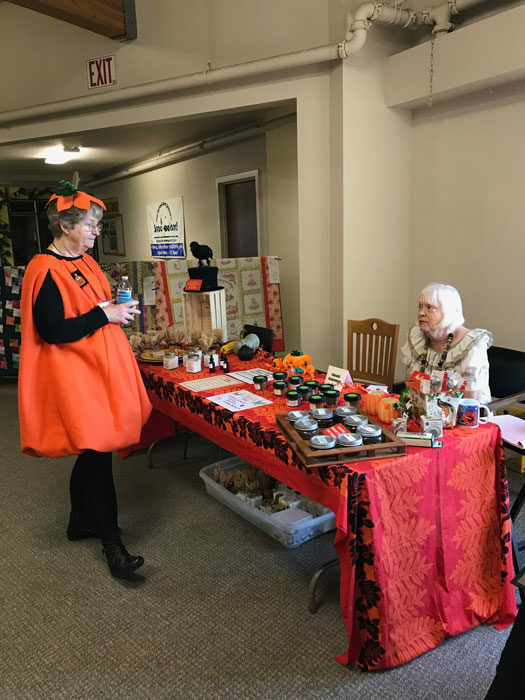 I was lucky to be staged right inside the door, which guild members had decorated with a Halloween and autumn theme. 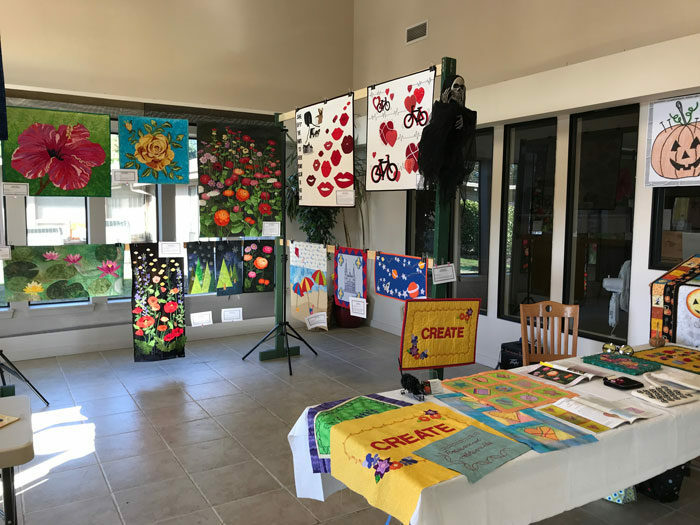 Some photos of my exhibit. 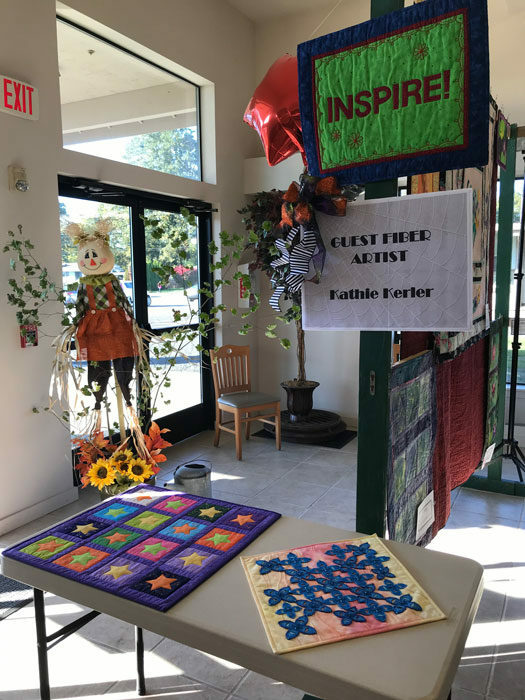 Doris Hale, guild member, was the featured quilter. 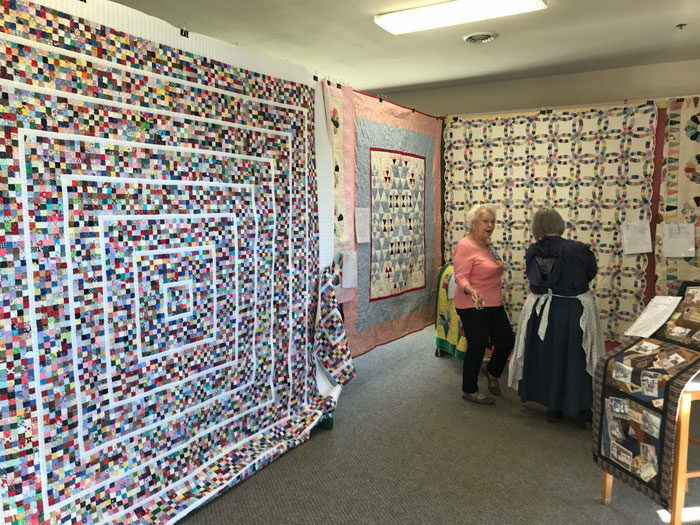 She showed a large number of traditional quilts. 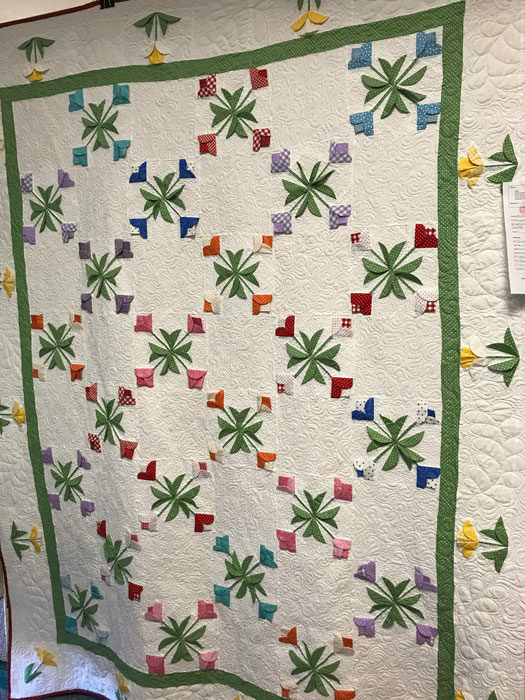 My favorite was her postage stamp quilt. 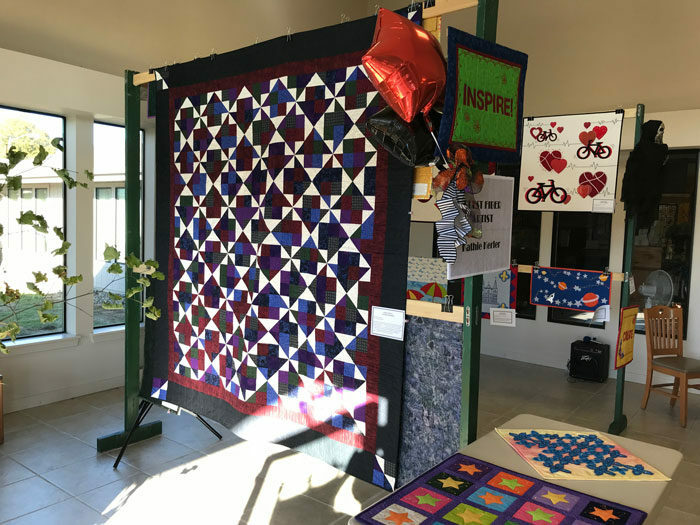 Columbia River Piecemakers has fifty members who displayed 200 quilts. Very impressive. 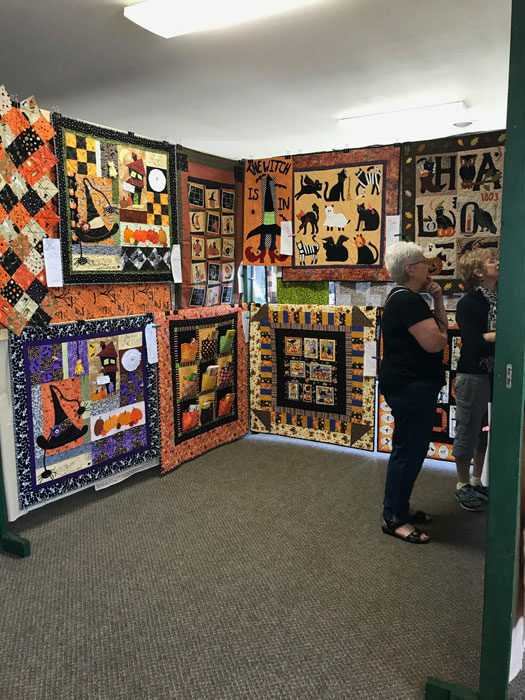 They showed an amazing number of Halloween-themed quilts. This is just one of the displays. 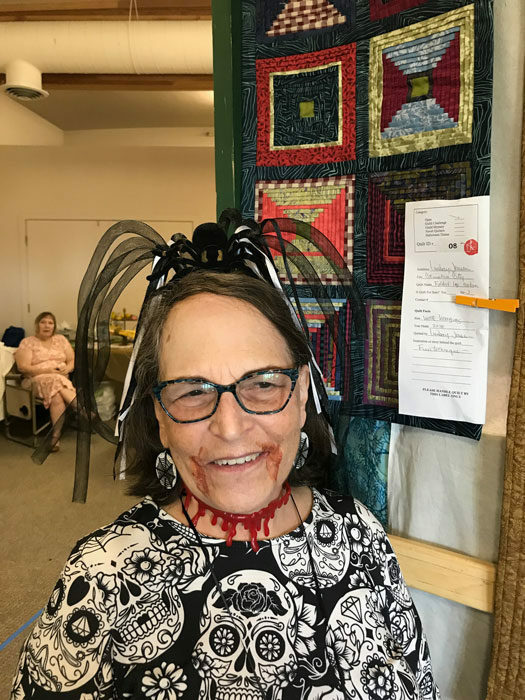 Several members got into the spirit of the costumes. Lynn Schultz dressed as a pumpkin. 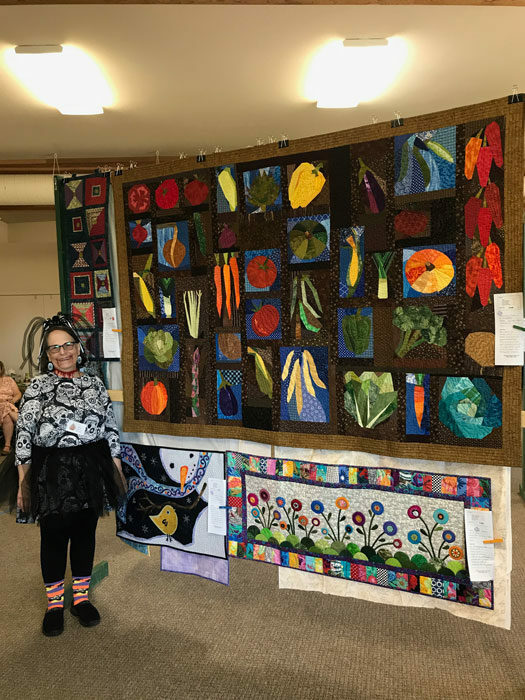 Here’s Judy Demeire standing next to her quilt, which is the vegetable quilt on the top of the display. And here’s Judy with “blood” dripping down from her mouth and neck. I loved her spider headwear. 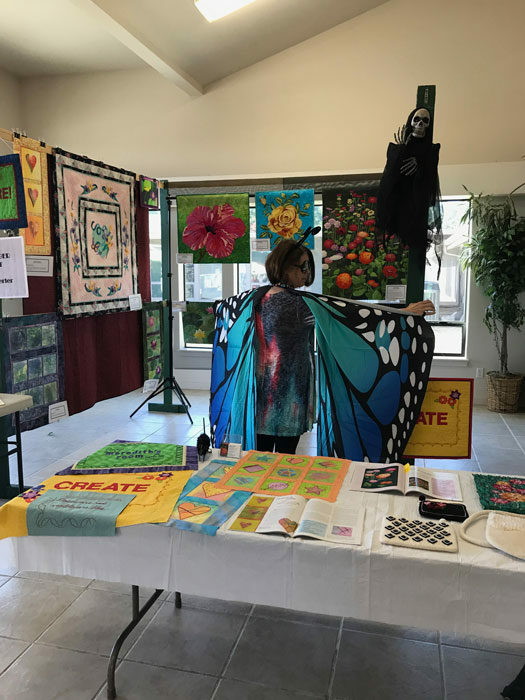 Even the quilt shop vendor dressed up. 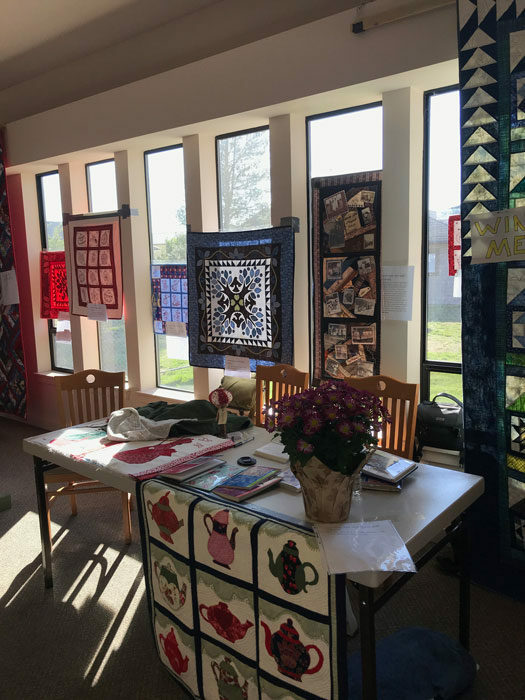 Two quilts caught my eye. The first is by Judy Demeire. 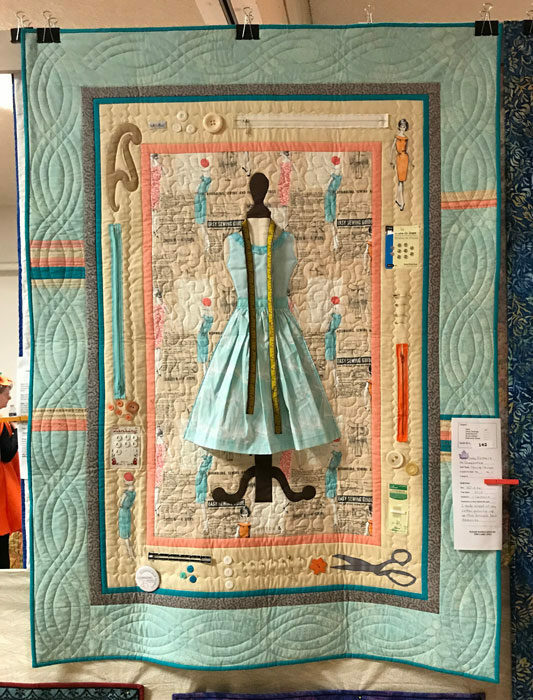 Her embellishments were wonderful. As you can see, Judy is multi-creative. 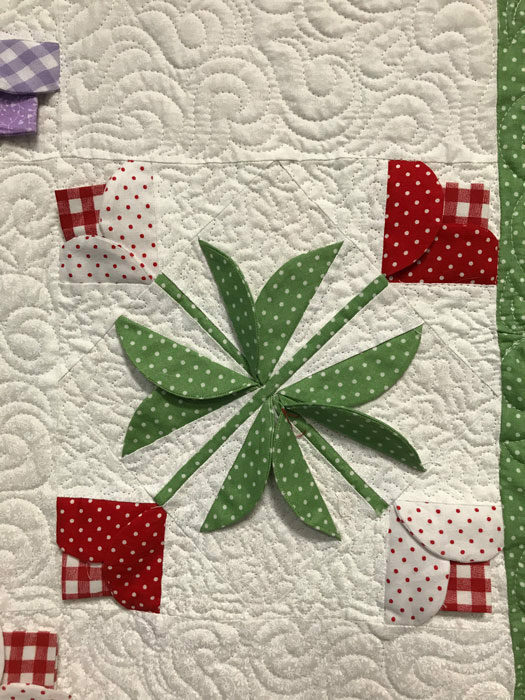 The quilt below features 3-D elements which caught my eye. The maker is Tara Baca.